The extinct airline's moon project never got off the ground, but it can teach us plenty about today's commercial space race. With its lunar dream, the airline tapped into a collective euphoria sparked by such milestones as NASA’s Saturn V rocket and later Neil Armstrong’s trek across the moon’s surface. The Space Race was in full swing, and the United States was determined to best the Soviet Union in its pursuit of interstellar glory. Science fiction novels depicted a lunar surface crowded with colonies, while scientific studies waded into humanity’s inevitable spacefaring future, characterized by lunar crop fields and encounters with aliens. And then Pan Am got a little boost from Hollywood. Before the Star Child, before the monolith, before HAL 9000’s rendition of “Daisy,” came a detail you might have missed about Stanley Kubrick’s science-fiction epic, 2001: A Space Odyssey. It had product placement for Pan Am’s moon ambitions. In one scene, the fictional Pan Am “Space Clipper”—emblazoned with the carrier’s unmistakable logo—docks inside a gigantic space station miles above Earth. The image delivered a stirring visual of Pan Am’s idea, and also convinced more than a few Americans that the airline’s moonshot was legit. Kubrick’s space masterpiece came out in 1968, just as NASA’s triumphs in the real world added an element of realism to Pan Am’s dream. The moon landing, for one, opened the floodgates for prospective astronauts around the world. "There was a steady, albeit small, flow of requests for reservations after Mr. Pistor's inaugural booking," Peter McHugh, Pan Am's senior vice president of marketing told the Florida Sun Sentinel in 1989. "The real deluge came after the successful Apollo 8 mission on December 22, 1968, and the lunar landing of the Apollo 11 on July 20, 1969. During those months, the concept of scheduled passenger service to the moon quickly shifted from science fiction to the realm of the possible." The moon landing wasn’t the only thing getting the public excited. By the late '60s, aviation in general had evolved from a niche and expensive luxury into a massive commercial industry enjoyed by middle class families. The remarkable change from dangerous and flimsy aircraft to the modern airliners we know today came about in just three decades, says Weitekamp. The blinding pace of innovation lent credence to the belief that Pan Am could very well deliver on its futurist promises. That hope and expectation continued to balloon, with Pan Am touting the moon program in national media throughout the 1970s and '80s. Eventually, though, airline deregulation helped bring about Pan Am’s demise. But the legacy of its moon project’s optimism—and its ultimate failure—live on. 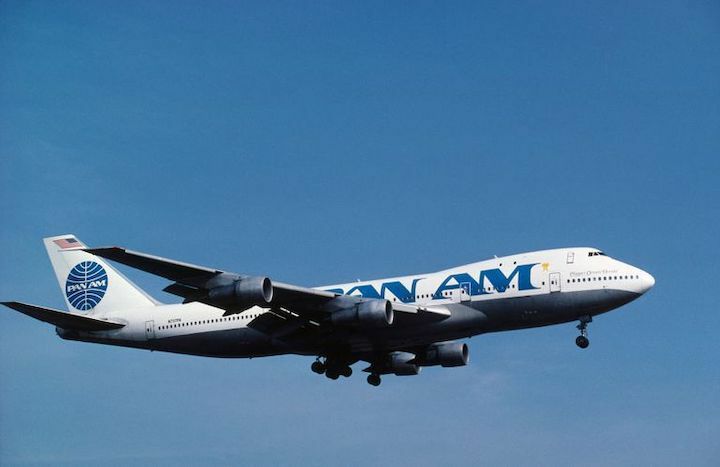 Truly, Pan Am was ahead of its time. To understand the lunar projects of Jeff Bezos, Elon Musk and Richard Branson, it makes sense to start with Pan Am’s moon program, which coupled the same sense of ambition and grandeur with a marketing savvy unparalleled by anything before it. 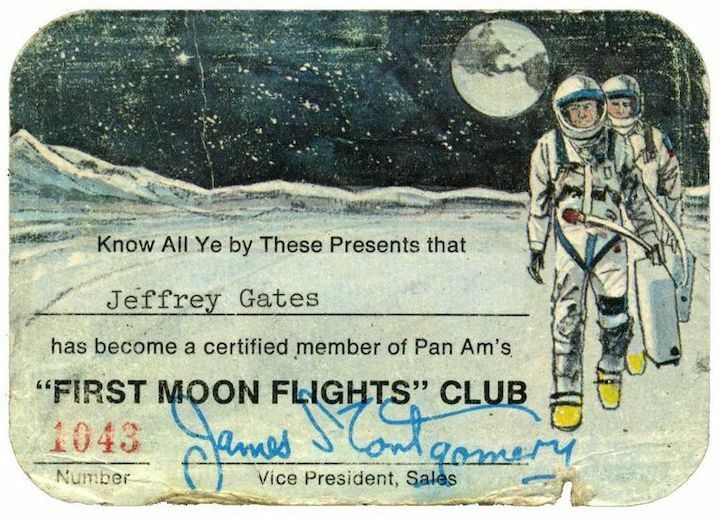 With its First Moon Flights Club, Pan Am laid the conceptual framework for space tourism, honing an idealism that still holds true among modern giants like Virgin Galactic, Blue Origin and SpaceX. SpaceX’s Elon Musk, for example, has vowed to make humanity an “interstellar species” that freely roams the cosmos. But just as Pan Am struggled to make its moon program a reality, commercial aerospace players like SpaceX and Virgin Galactic have so far failed to deliver on their grandiose schemes. In 2009, Virgin Galactic CEO Richard Branson gave his company an 18-month timeline to make its first successful space flight. The reality came a decade later—after numerous other promises and the VSS Enterprise disaster—when the company launched its first paying passenger into orbit earlier this month. SpaceX, too, though less intent on fostering a space tourism boom like Branson, had to endure intense growing pains before it could even get a rocket into orbit. Despite the setbacks, the current crop of aerospace juggernauts have their sights set onmoon landings in the near future, and are selling tickets for a quarter-million dollars. And so far, the waiting lists remain cluttered with names that still haven’t left the Earth.